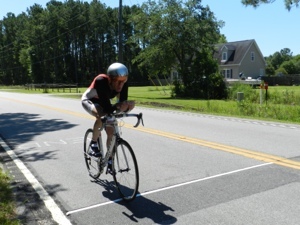 After nine months of training including over 3,000 miles of bicycling, we headed for the coast last Friday for Martin to compete in the South Carolina State Time Trial Championships. When he was working, he didn’t have the time to dedicate to rigorous training and the chance to place in the top three. So, the time trial made it onto his retirement bucket list. The championship breaks the riders up into age categories. Even though Martin is only 59, on his next birthday, he’ll be 60 so he is in the 60 – 65 year olds. Weird, but that’s how they do it. Being one of the youngest riders in his age category presents the opportunity to check a gold, silver or bronze medal off his bucket list. Packed and ready, Friday morning we drive the three and a half hours through the Land of Charles to Charles Town for the race. For you history buffs, Carolina is latin for Charles. The “Merry King” Charles granted the land of the Carolinas to his buddies but named it for himself. Then, his grateful friends, named the sea port Charles Town, which, obviously, eventually became Charleston. A liberal bastion in a conservative state, Charleston is known world wide for its gracious southern hospitality, beautiful historic district, jazz clubs and inspired regional cuisine. However, the area is chosen for the time trial, not for any of the above, but because it’s flat, flat, flat. Oh, yeah, the beaches are gorgeous, too. After a yummy lunch of chicken and pasta in fresh tomato sauce at the Kings Street Grill, Martin and I head north on Highway 17 to find the time trial course. The 25 mile course starts at Seewee Outpost north of Charleston. Driving the highway, the first thing I notice is the lack of buildings and parking lots up against the street. Looking down the road, it appears you’re in the middle of no where, as all you see are towering pines and oaks with an occasional sign announcing a shopping center or business hidden behind the green space. These folks do not want an ugly view of brick, steel and asphalt. Whoever’s in charge of city planning is really in charge. The green space isn’t the usual landscaped facade put up after all the natural vegetation is bull dozed to oblivion, then burned or hauled away. It is the natural vegetation! It’s the green stuff Mother Nature put there. Under mature pines and oaks is what most folks would call scrub brush. Saplings, native grasses, Spanish bayonet, Dogwoods, vines, whatever Mother Nature dictates. And, peeking through the deep expanse of green, I spy the most beautiful Walmart I’ve ever seen. Yes, really. A Walmart in full brick, huge curved front wall and columned portico on its face. Looking at all this, we somehow can’t find the Seewee Outpost. Well, maybe it’s because the navigator (me) is too busy looking at the great big nursery we pass. But, with all the green space, we zip right by the Outpost. Looking at our map on the iPad (no, we don’t have a GPS…we’re old fashioned that way), I know it should be on the edge of Francis Marion National Park. So, I tell Martin to pull into the Education Center of the park and I hop out to just, quick like a bunny, run in to ask where the Outpost is. Inside, the ranger tells me the Seewee Outpost is about a mile back on the right. As I listen to her I see a table filled with info on native plants, habitat building and attracting butterflies. When she finishes giving directions, I tell her how I’m a Master Gardener with an interest in native plants and ask if I can take some of the flyers. “Oh, I have something for you! Just come with me.” She says. So, I follow her into a back room where we keep chatting as she pulls open long, narrow drawers and starts handing me beautiful posters on slick paper. Posters of South Carolina wild flowers, edible plants, mushrooms and trees. By the time Martin starts worrying about me and comes inside to hunt me down, I have four posters, which the ranger and I are rolling up to secure with a rubber band. Did I mention Charleston is known for it’s southern hospitality? Saying goodbye to my new friend and wishing I had more time to spend at the Education Center, Martin and I drive back to the Seewee Outpost, buy some bottled water and then drive the time trial course so he knows what to expect with the terrain. It’s flat, Baby, flat. Before heading back to our hotel, we stop at the big nursery and, of course, I buy a plant. Next morning race registration starts at 7 a.m. so we arrive at, you guessed it, 7 a.m. Martin registers. Then, we forage for breakfast. He’s #67. Time trial starts at 9 a.m. with a rider pushing off every minute. That translates into a start time of 10:06 for Martin. The wait begins. Back from breakfast, he wanders around talking to other riders and watching the first ones out of the gate while I start taking photos and log in to Facebook to post the event for our family and friends. The well wishes come rolling in. Finally, shortly after 9 Martin starts getting ready, squeezing into his, well, skintight skin suit. A 76 year old rider, the oldest person in the time trial, holds the bike for Martin as he gets into his shoes, shoe covers and tear drop helmet. Then, off he goes to warm up. I keep shooting photos and posting, family and friends engaged in our event as the “likes” and comments keep coming. 10:06 a.m. and he’s off! I won’t see Martin again for another hour plus a few minutes. So, I stand near the finish line, talking to other waiters as we listen to the officials shouting “rider coming in” and watch as each competitor pedals furiously toward the end. As the riders stop and talk to each other, I overhear comments about a 10-12 mile an hour wind. Headwind in both directions. How is that possible? One after the other, they report not their best times. As 11:10 turns into 11:15 and still no sign of Martin, my heart sags. His time is not what he expected. He probably won’t place. Yet, a part of me holds hope the riders talking about the wind interfering with their times represent all the riders. If everyone’s having slower times, Martin could still place. I remind myself he’s a winner no matter what, just for all the effort he put into training and then, showing up. But, I want him to place. I want him to proudly check this off his bucket list. Finally, I see him. Even under the helmet and sunglasses, I can tell by the way he’s pedaling, he’s out of energy. Tired. Like every other rider, Martin summons a last ounce of will power and pedals furiously to the end as I snap a photo. Whizzing by me he pedals to the end of the road, turns around and comes back. He can hardly talk. Sweat pours down his red face. Is he shaking? Yes, he’s shaking. I ask if I can get him a water. He mumbles, “Later”, then, s-l-o-w-l-y rides back to the car. I stop at the water tent anyway where one of the officials gives me some type of energy drink. “He’ll like that”, the official tells me. As I hand Martin the drink, I see disappointment on his face. We talk about how his time wasn’t good and I tell him about the other riders’ comments about the wind. “Yes”, he says, “the wind was awful both ways.” I see a gleamer of hope in his eyes. As Martin sips the energy drink, he recovers from the stress of the ride and walks down to the officials’ tent where they tell him they’re close to posting everyone’s time. He walks back to the car to tell me. Well, at least the wait will be over. Finally, at the tent, crowding around a board with all the other riders, Martin looks on the sheets of paper for his age category and name. Reading across, he sees it. And, next to his name under state ranking is the number 2! Wahoooooo! A silver medal. All smiles now, he finds me. “It’s official”, he says. “I’m the second fastest old man in the state.” Check.